Whatever you want - walking, climbing, browsing in quiet bookshops or just drinking in the atmosphere - Wales has something to offer. Wales does not just give an experience; it is an experience in itself. We are located in the Taff Valley's of South Wales, check out our local interests section to find out more about what the surrounding area has to offer. IMPORTANT - MOST SAT NAV'S OR ROUTE PLANNERS DON'T WORK WITH OUR OWN POST CODE. FOLLOW THE DIRECTIONS BELOW OR USE CF37 5YE WHICH IS THE POST CODE FOR THE GRIFFIN MILL PEUGEOT GARAGE. CARRY ON PAST THE ENTRANCE TO THE GARAGE AND FOLLOW THE COUNTRY LANE UP THE MOUNTAIN. ACCESS - OUR CENTRE IS ACCESSED VIA A NARROW COUNTRY LANE. VEHICLES BIGGER THAN 29 SEATS CAN STRUGGLE TO GET UP TO US. IF YOU NEED TRANSPORT FOR A LARGE GROUP PLEASE DISCUSS THE OPTIONS WITH US. WE CAN ALWAYS GET YOU UP TO US! From the South (Cardiff/M4) - Head onto the A470 towards Merthyr Tydfil. Leave at the 3rd exit for Rhydyfelin. Drive down the slip road onto a roundabout and leave the roundabout on the 6th exit sign posted EGLWYSILAN/SUPERSTORE/RETAIL PARK. 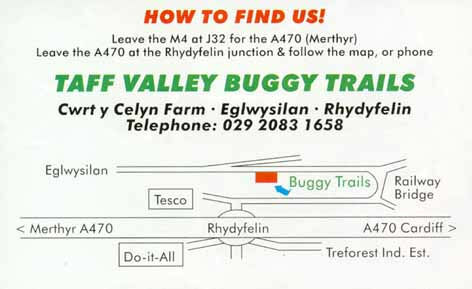 Take an immediate right turn where you will see our first brown Taff Valley sign (don't go up the hill towards Tesco) then you should pass the entrance to the large Griffin Mill Skoda/Peugeot garage on your left-hand side. Continue forward. The road will narrow to a country lane, proceed for about 700 metres and take a left over a railway bridge (by our 2nd brown sign), left again (3rd brown sign) and we are on about another mile further up the mountain. When the road flattens out you will pass over a cattle grid next to a farm, we are 350 metres further ahead.Turn left through a gate at the 4th quad centre sign. From the North (Merthyr/Brecon) - Head for the A470 towards Cardiff. Leave the A470 at the exit sign posted TREFOREST IND.EST (NB: Not Treforest Univeristy of Glamorgan, but the one after). Drive down the slip road onto a roundabout and leave the roundabout on the 1st exit sign posted EGLWYSILAN/SUPERSTORE/RETAIL PARK. Take an immediate right turn where you will see our first brown Taff Valley sign (don't go up the hill towards Tesco) then you should pass the entrance to the large Griffin Mill Skoda/Peugeot garage on your left-hand side. Continue forward. The road will narrow to a country lane, proceed for about 700 metres and take a left over a railway bridge (by our 2nd brown sign), left again (3rd brown sign) and we are on about another mile further up the mountain. When the road flattens out you will pass over a cattle grid next to a farm, we are 350 metres further ahead.Turn left through a gate at the 4th quad centre sign. NOT DRIVING? - Pre-arranging transport is necessary, especially for groups. We not easy to access via public transport. Let us help you with hiring taxis/buses/coaches in advance, or just point you in the right direction. If you plan to use a train, you will need to pre-arrange a taxi from the station to us (closest stations - Treforest, 10 mins drive or Pontypridd, 15 mins drive) as it is too far to walk. Taxis on the meter from the city are not advised. We have great local contacts helping our clients every weekend. OTHER ACTIVITIES AND VENUES - Occasionally we arrange the same activities at other locations, or different activities which you can mix with ours. We will provide you with details of alternative venues and will also provide you with very detailed directions for the routes you will need to do.